Jypyä Pop (Turku, Finland) on 17 January 2018 in Lifestyle & Culture and Portfolio. Jolie vue sur les canons à neige. it's not possible ! Here, you make artificial snow too? I thought that you did not need them. Have a nice daymy friend. @Graciel·la (Vic. Catalonia): In southern Finland, almost all skiing competitions are held on this ladder. There is so little snow in nature that the race will not succeed. Weather forecasts indicate that snowfall may be snowing in the next few days. Snow created by snow is a good base for skiing trails, where many skiers are moving. There are many trails that last longer than a lot of natural snow. When it comes to sleep, get up early in the morning. I also wish you a nice pie for you too. Very nice colours and good capture. I meaned that it was very much natural snow in your land. Incredible capture!! I have never seen these in action! Thanks for sharing. Fabulous to see the snowmachines in action!!! 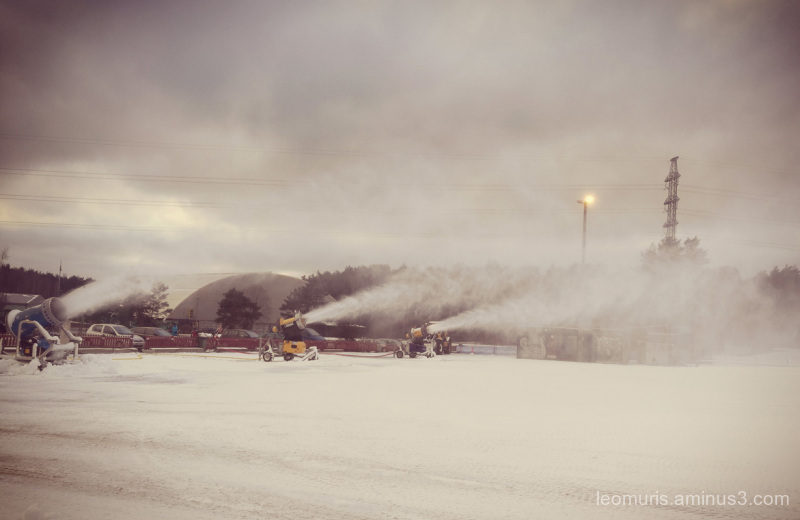 Our ski resorts use snowmaking also. Cool shot. A three gun salute to the skiers. The snow machines and your image are quite impressive. Superb capture and beautiful composition and tones . Very nice capture, scene and treatment! Fantastic image here ! Wowwwwwwwwwwwwwwwwwwwwww !!!!!!!!!!!!!!!!!!!!! !